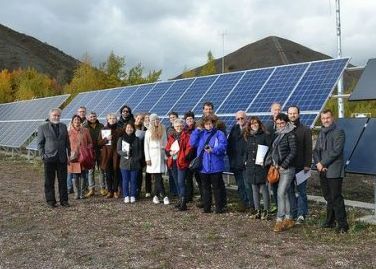 The second POCACITO study tour took place last October in Paris, Loos-en-Gohelle and Brussels. Participants were mainly urban practitioners coming from all over Europe, but also from China and the US, many of them representing the 8 POCACITO case study cities. The topics covered climate change adaptation and mitigation, energy transition, innovative urban greening actions, energy-efficient renovation of buildings, local governance and cooperation with citizens and local stakeholders. Two round tables then gave the floor to the Cities of Vienna and Frankfurt, focusing on their path "Towards carbon neutral cities" and "100% renewable territories". The agenda of our last day of visits in Brussels, hinged on both the Brussels-Capital Region and the City of Brussels climate plans, with very interesting exchanges between the participants, representatives from the City of Brussels and from Brussels Environment, on how the two levels of governance interact. A focus was made in the afternoon on the Brussels-Capital Region policy in the field of sustainable building, including technical site visits from the “Be.Exemplary” call for projects.